Are you ready for endless clicking on Fakeballs to catch Fakémons? Let’s go! Fakémons are out there! Now you can catch them by clicking on Fakeballs. Welcome to our brand new clicker game. 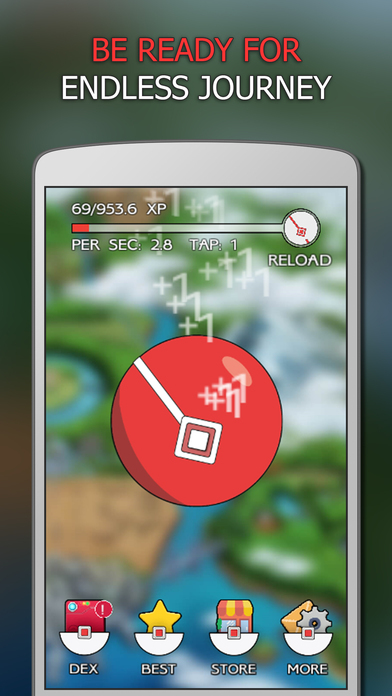 It is an awesome incremental game for everyone, and especially for fans of Pokemon. – Endless clicking. Just kill your time by tapping on screen. – Discovering and collecting Fakémons in Dex. Try to collect all of them. – Various Fakéballs: from “Lawn Ball” to “Neptune Ball”. – Good sound effects and awesome background music. A big thanks to http://phoenixdex.alteredorigin.net/ for sprites of Fakemons (they are available for free use under a Creative Commons Attribution-NonCommercial 4.0 International License (CC BY-NC 4.0)). And thanks to Templateswise.com web portal for background music. This is unofficial indie game and is not associated with ©Pokémon or ©Nintendo companies. It is fan fiction. All in-game descriptions, characters and images belong to their respective owners.